Courtney + Tyler were married at St. Aloysius with a reception at The Renaissance Hotel with Tres Chic Event Planning. Save the date and wedding invitation features a mushroom ink thermography with silver and gold. Chantal + Sean were married at The Bell Event Centre. 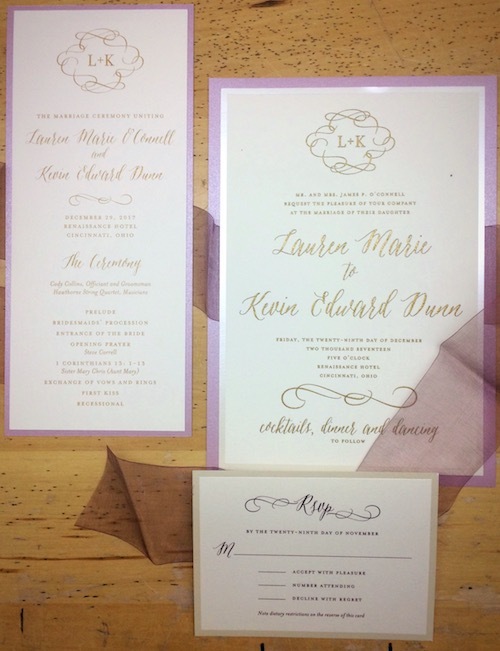 Their wedding invitation features text and decorative flourishes in a brilliant gold foil. Nothing says Happy New Year like golds, silvers, wreaths, pine cones and glitter! Laura + Gregg were married downtown Cincinnati at The Renaissance Hotel. Contemporary square invitation features a mix of black with silver foil and envelope. Nicole + Taylor were married at Immaculata Church with a reception at The Westin Cincinnati. Anna + Austin were married at St. Williams Catholic Church with reception at The Phoenix. Wedding invitation features elegant gold thermography and gold envelope liner. We love the evergreen and pinecone details for a subtle hint of winter celebration.